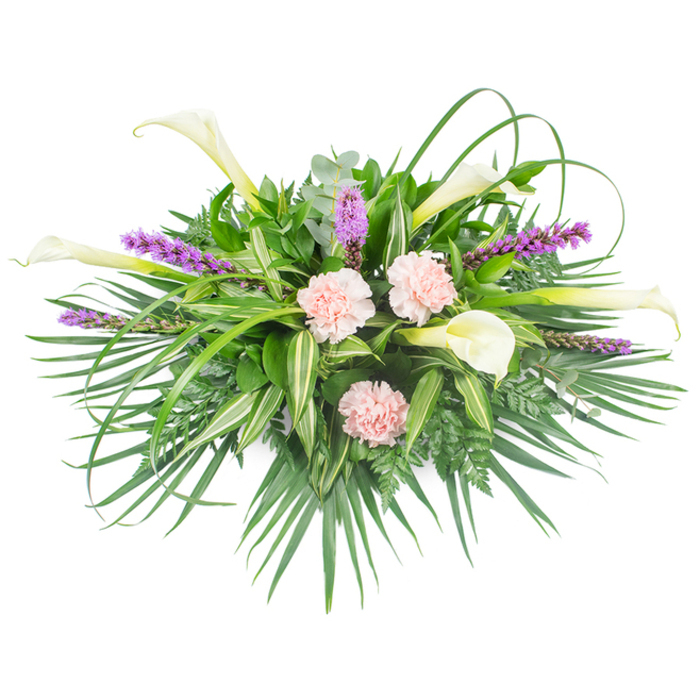 Let them know how much you care with a lovely floral arrangement made of graceful calla lilies, pink carnations, liatris spicata and lush greenery. A delicate way to represent your thoughts and feelings in those difficult times. Size dimensions remain the same. More stems are added to the additional sizes. I ordered flowers for my untie who had just lost his best friend. My flowers were the first ones she received. That was speedy delivery. Timely delivery of the flowers. The team paid attention to all of my requests for the flowers and were very friendly. Totally recommending them. Very reliable florist. Sent an email with an inquiry and they were very fast to respond. They offered to create a personalized tribute for my friend's funeral. The florists did a wonderful job and arranged a very beautiful tribute out of roses, chrysanthemums and gypsophila. I'm here to write the most positive review about this company! They were nice, friendly and extremely helpful. 100% satisfaction! Pleased with their services. They delivered on the next day and the flowers were beautifully arranged and fresh. The florists did absolutely amazing job.